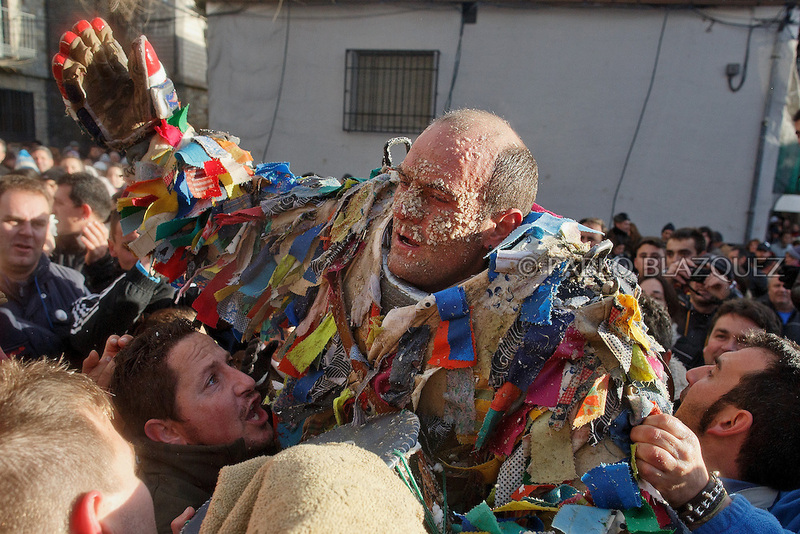 People cheer and lift Raul Beites as he stops for a breath as he makes his way through the streets representing Jarramplas and beating his drum during the Jarramplas Festival on January 20, 2015 in Piornal, Spain. The centuries old Jarramplas festival takes place annually every January 19-20 on Saint Sebastian Day. Even though the exact origins of the festival are not known, various theories exist including the mythological punishment of Caco by Hercules, a relation to ceremonies celebrated by the American Indians that were seen by the first conquerors, to a cattle thief ridiculed and expelled by his village neighbours. It is generally believed to symbolize the expulsion of everything bad. This year the people who represented Jarramplas were Angel Cerro Fernandez on 19 January and Carlos Calle Rodríguez 47 and Raúl Beites Sánchez 34 on 20 January.